While Widmyer was impressing on the mound it was two big innings on the offensive side of the ball that saw the Rebels score all of their runs. In the first inning after seeing Tatum Arboleda and Haven Pesce reach base it was a single from Amber Campbell that would bring both runners home and give the Rebels a 2-0 lead after one. “Amber getting that hit in the first inning to get the first two runs in was huge for us,” said Coach Aiken. The Rebels would add to their lead in the fifth inning as Krista Whiteside, Widmyer, and Pesce all scored putting the Byrnes lead at 5-0. In the top of the sixth inning with one out the Rebels had a scary moment as Widmyer was struck in the leg on a line drive back up the middle and was replaced on the mound by Haylee Whitesides. Whitesides would complete the shutout for the Rebels getting the last four outs of the game. 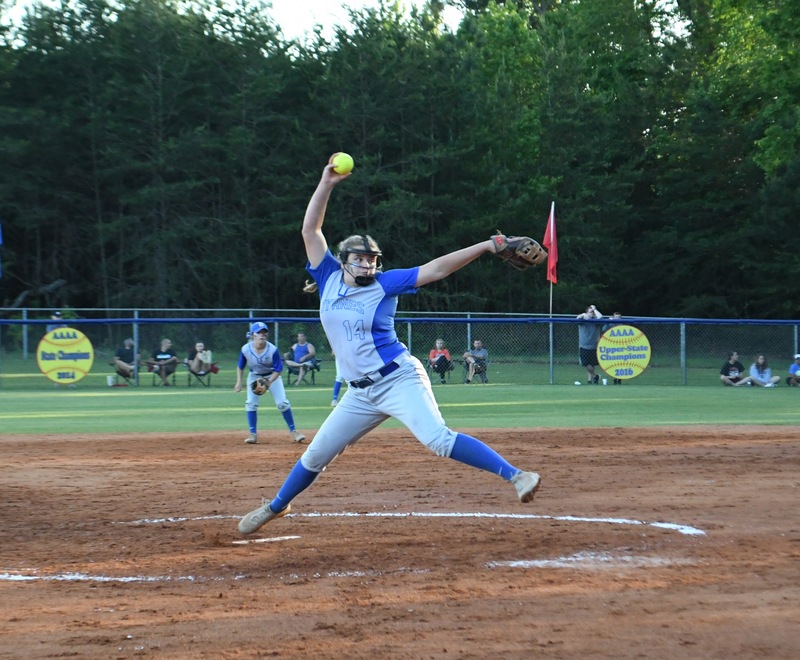 The situation was much the same in the 3A Upper State playoffs, as Region III foes Woodruff and Broome met in a winners’ bracket contest. The Lady Wolverines got a huge game from Madison Littlefield in the circle and at the plate to notch a 3-1 victory over the Lady Centurions. Broome tallied a run in the second inning of the contest as Gracie Phillips singled to score Brittany Coxey. Hailey Wells made the run stand up through four innings, working out of jams as the Lady Centurions played solid defense behind her. In the fifth, though, Littlefield helped her own cause. After Brooke Satterfield and Brooklyn McElrath reached with one out, Littlefield launched a laser to the right-centerfield fence, scoring both runs and ending up on second base. Haley Beck drove in Littlefied with an insurance run for the eventual 3-1 final. Littlefield gave way to Olivia Patton in the circle, and Patton nailed down the final six outs despite a Broome threat in the 7th. The tying run reached second base with the potential game-winner at the plate before Patton recorded a strikeout to end the contest and send Woodruff to Friday’s Upper State title game. The Lady Wolverines need one win to advance, while the winner of Wednesday’s Crescent-Broome game will have to beat Woodruff twice.